Help patients with Parkinson’s disease improve ambulation, increase function and reduce the risk of fall. With more than 60,000 new Parkinson’s disease cases reported annually, Biodex Balance & Mobility devices can help this growing, and underserved population. Intense exercise has been shown to slow the progression of symptoms. Locomotor disturbance is among the early signs of Parkinson’s disease. As the disease progresses, there is an increased risk of falling. Biodex offers effective rehabilitation to address fall risk as well as balance & mobility to strengthen patients either pre- or post-incident. Through the use of Biodex technology patients with Parkinson’s disease can improve their confidence in home and community ambulation, and may reduce the risk of serious injury due to falls. Patients with Parkinson’s disease represent a wide ranging opportunity for inpatient and outpatient rehabilitation service providers. Biodex technology can help set your clinic apart – making it attractive to ACOs, hospitals, doctors, patients and their families. According to the Parkinson’s Foundation, Parkinson’s disease affects 1 million people in the United States and 10 million worldwide. 60,000 new cases are reported annually. These figures are expected to increase as the average age of the population increases. Both prevalence and incidence of Parkinson’s disease increase with advancing age. Rates are very low in people under 40 and rise among people in their 70s and 80s. The disorder appears to be slightly more common in men than women. Nearly 70% of people with Parkinson’s disease experience a fall; 15% of those falls result in fracture. Intense exercise can slow the progression of Parkinson’s symptoms. The Biodex Balance System SD is a multifunction diagnostic and therapeutic instrument used in thousands of clinics around the globe. Many therapists have determined that the balance issues characteristic of Parkinson’s disease can be more easily and accurately identified and documented through the use of the multiple training and testing modes available on the Biodex Balance System SD. Balance exercise and training can improve postural stability and reduce fall risk. Vibrotactile cueing provides a means to enhance postural control with eyes closed and improve balance rehabilitation by directly engaging the motor-learning system, reinforcing neuroplasticity, and providing sensory enrichment to therapy tasks. The Biodex Sit2Stand™ Squat-Assist Trainer guides patients through the seated to standing motion in a safe environment. Through repetition a patient builds both lower- and upper-body muscule strength and endurance, improves flexibility and ideally achieves functional gains. Patients with low force production and hypokinesia can learn to improve force in a functional task and improve dopamine release and enhanced expectancies. 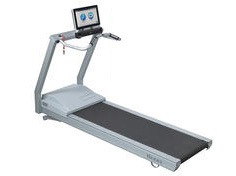 The BioStep 2 can be used as an alternative exercise option to treadmill walking. The upper- and lower-extremity zero-impact exercise loosens characteristically tight muscles. 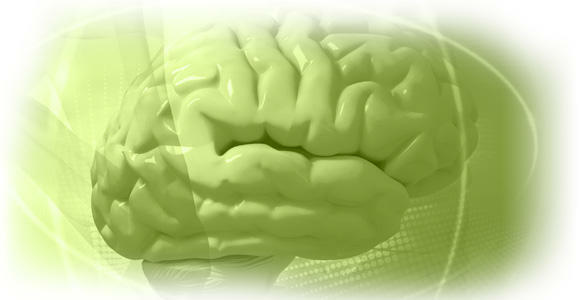 When patients with Parkinson’s disease come off the BioStep they are able to ambulate easier and freer, without tiring. Ideally patients will exercise 3-4 times per week on the BioStep to maintain gains. 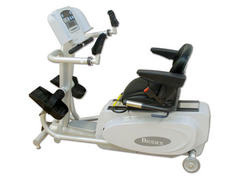 Proven to be very effective for MS and Parkinson’s disease, the motion training of medBike helps loosen and strengthen muscles, and reduce spasticity. Research has shown that some people with Parkinson’s disease can benefit by exercising in the Pedal Assisted Mode at the higher rpm levels that the medBike can offer, up to 90 rpm. The Continuous Control System avoids overstraining the lower- and upper-leg muscles, creating safe exercise conditions. The Gait Trainer 3 differs from an ordinary treadmill with its specialized rehabilitation design for patients with neurological involvement such as those with Parkinson’s. The instrumented deck monitors and records step length, step speed and step symmetry – all gait factors that must be corrected in Parkinson’s disease if patients are to reduce their risk of fall. Patients are motivated by real-time audio and visual biofeedback, keeping them on target in each phase of rehabilitation. Summary reports are available to track progress and document outcomes. Those with significant instability due to Parkinson’s disease or have injuries as a result of a fall can benefit from body-weight support provided by the Biodex Unweighing System. Body-weight support treadmill training (BWSTT) has demonstrated beneficial in many studies of patients with Parkinson’s disease. The Biodex FreeStep SAS is an overhead track and harness system that provides a safe ambulation environment for both therapist and patient. The FreeStep facilitates enhanced medical rehabilitation (EMR) and promotes Reactive Balance Training, allowing patients to purposely fall to prepare for risks during ADLs and learn to fall the correct way to avoid injury.